Sarah Louise meeting the Queen. 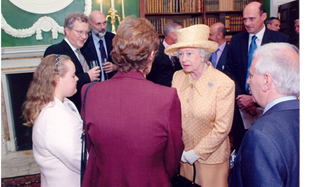 Her Majesty was very interested to hear of Sarah’s achievements in swimming from local to international level. Many of our members are competitive swimmers. They train each week and compete at local, regional, national and international level, dependent on their achieved times. They are all members of Special Olympics GB and have trophies and medals from their various competitions. Sarah and Iain World and European Champions in the Down’s Syndrome Category competing worldwide. Both swimmers are also Special Olympic Swimmers. Bexley Beavers, Crook Log Leisure Centre. 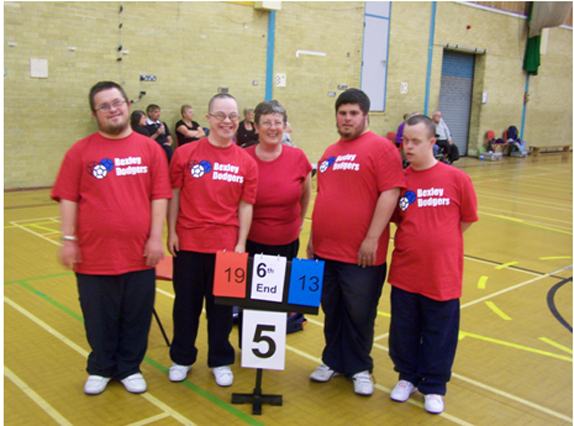 The Bexley Dodgers Boccia Team compete against other Boccia teams throughout the region. 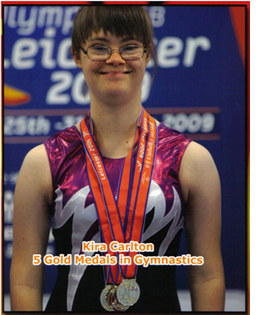 Kira aged 12 competed in the Special Olympics in Leicester 2009. She won 5 gold medals for bar, beam, floor and vault and overall highest score for the Team.